The Serapis Flag has a unique history. 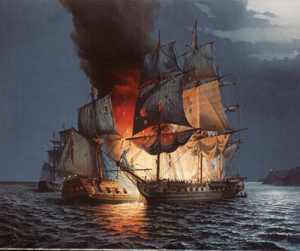 It was flown by American naval Captain John Paul Jones from the captured British frigate HMS Serapis after a dispute between the Dutch and British governments erupted when Jones sailed the captured frigate into a Dutch port. The flag is unique because of its 8-pointed stars and the irregular pattern of red, white and blue stripes. It may have been designed by Benjamin Franklin when he was America's first Ambassador to Paris. The Serapis Flag is unique because of its 8-pointed stars and because its red, white and blue stripes are organized in a pattern not found on other American historical flags. The 13 8-pointed stars are arranged in 3 rows of 4, 5 and 4 on a blue field. The flag is also more square shaped than rectangular. The Serapis Flag, also known as the John Paul Jones Flag, had its origin in a famous Revolutionary War sea battle called the Battle of Flamborough Head, which was fought just off the east coast of England on September 23, 1779. In the battle, Jones' small fleet of ships challenged the HMS Serapis, a 44 gun British warship that was protecting a massive merchant convoy of 50 ships returning to England from the Baltic Sea. During the battle, the Serapis, captained by Richard Pearson, and the USS Bonhomme Richard, Jones' flagship, became entangled side by side and proceeded to blast holes in one another until both ships were severely damaged. The Bonhomme Richard had so many holes in it you could see right through from one side to the other and British cannonballs were flying right through without hitting anything! Captain Pearson asked Captain Jones if he was ready to surrender and Jones famously replied, "I have not yet begun to fight!" In spite of the fact that the Bonhomme Richard was severely damaged and taking on water fast, Captain Pearson is the one who finally had to surrender. Another ship in Jones' fleet called the Alliance had joined her and was blasting the Serapis as well. Pearson finally decided to surrender because his main mission, protecting the merchant fleet, had been successful because they all escaped unharmed and because he could not survive with two ships blasting him much longer. Captain Jones boarded the Serapis and his crew tried to save the Bonhomme Richard over the next 2 days, but eventually they gave up and the ship sank on the 25th. Captain Jones then sailed the severely damaged Serapis to the Dutch port of text to make repairs. 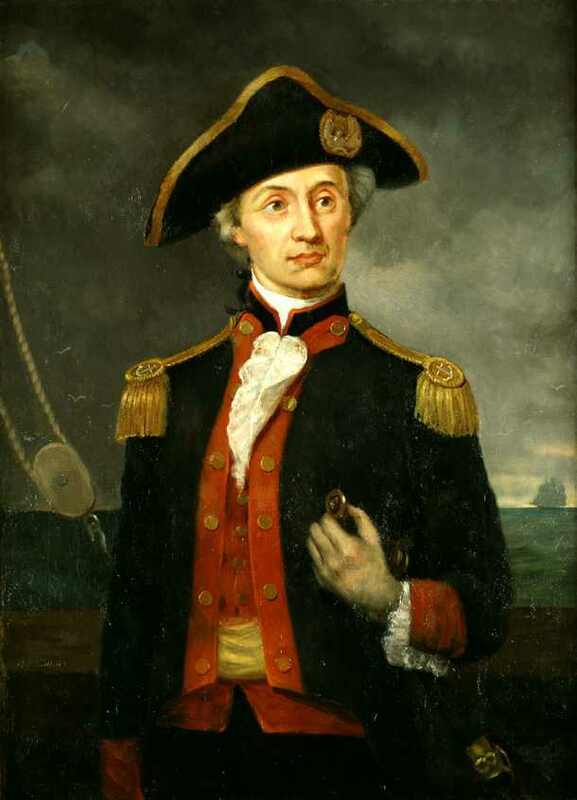 When John Paul Jones arrived at Texel, a diplomatic crisis arose. The Netherlands were officially neutral in the British-American war and the Netherlands had not yet officially recognized the United States as a sovereign country. The Serapis was not flying an American flag because the flag from the Bonhomme Richard had been blown off during the battle and went down at sea. This led to the British Ambassador demanding that John Paul Jones be turned over to the English government as a pirate, along with the Serapis, because, as he was not flying the flag of any known nation and he was sailing a captured ship, he was, according to international law, a pirate. Great Britain had declared Jones a pirate earlier because of other attacks on British shipping and villages along the coastline. His attacks in British waters had shocked the population of England and Scotland who formerly hadn't realized that the Americans were powerful and ingenious enough to make attacks against them across the ocean. Jones had become a priority target for the British navy. If captured, his "pirate" designation would have earned him the right to be hanged. The Dutch government was in a quandary. It did not want to support the British government, which was its longstanding maritime competitor. It also didn't want to get involved too heavily in the war between the British and the Americans. They decided to demand that Jones and his fleet leave the port by a certain date in order to make the appearance that they were not supporting the Americans, but they worked behind the scenes to find a way to recognize the ship and avoid having to turn Jones over. 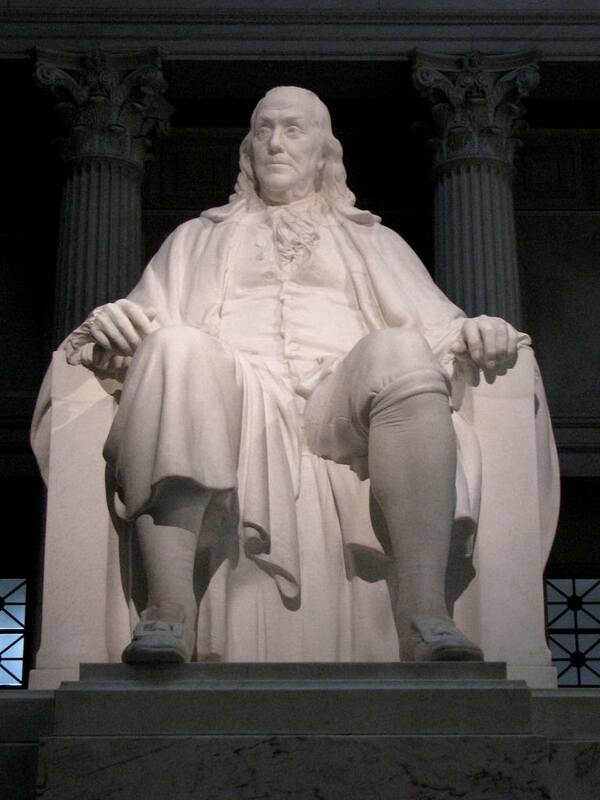 It should be noted that historians have not been able to confirm all of the following facts, but generally they have come to the following conclusion, that within a few days, someone in the Netherlands was in contact with Benjamin Franklin, the American Ambassador, in Paris. It is not known who the contact was, but perhaps Jones had suggested they should contact Franklin, who then wrote back to the Dutch government with a description of an American flag. Franklin's description was then sketched by the Dutch government and entered in the official Dutch register of national flags. Jones quickly had a flag created based on the sketch and the result was the Serapis Flag, which was then flown on board Serapis. This allowed the Dutch government the right to recognize the ship officially and avoid having to deal with the piracy charges. They were able to legally deny the English their desire to have the "pirate" Jones and their captured ship, Serapis, which was now a legitimate prize won in battle, turned over to them. Historians attribute the Serapis Flag design to Benjamin Franklin because he and John Adams wrote a letter to the Sicilian Ambassador in Paris a year earlier with the same flag description. For this reason, the Serapis Flag is sometimes called the Franklin Flag. You can read the Franklin and Adams letter to Ambassador Domenico Caracciolo here. The Serapis Flag sketch from the Dutch naval records has survived so we know exactly what the flag looked like. It is the only depiction of an American Flag with this unique design. Why did Franklin design the Serapis Flag like this? Why did he use 8-pointed stars and why are there red, white and blue stripes? Franklin had been in France since before this date. John Adams, whose name also appears on the letter to the Sicilian Ambassador, was in the US at the time of the Flag Resolution. It appears that neither of them had yet received the official description of the American flag. Franklin apparently urgently sent the same description from the earlier letter out of necessity to protect John Paul Jones from being turned over to the British. This storyline that most historians have agreed upon ignores one major factor. The entry of the Serapis Flag in the Dutch register of naval ensigns occurred one day after an entry was made with a drawing for a flag belonging to the USS Alliance, one of the other ships sailing in Jones' fleet. The drawing entered for this flag was the 13 star flag, sometimes called the Hopkinson Flag, that did fit the 1777 Flag Resolution. If Franklin had not heard of the Flag Resolution, how did a flag that matched the resolution get entered for the Alliance? Why was the same flag not used for both the Alliance and the Serapis? Had someone else received a description of the US Flag that Franklin hadn't received? These are questions to which the answers are unknown and probably will always remain a mystery. There is one more version of the story that varies greatly from the history given above. In this version, Franklin created the Serapis Flag before the Battle of Flamborough ever occurred, when the Dutch Ambassador requested a description of the American Flag so his nation's ships would know how to respond if they came across an American ship while at sea. Franklin then had the Serapis Flag created in Paris and the description was given to the Dutch Ambassador. The same description was given when the Sicilian Ambassador approached him with the same question. Later, when John Paul Jones sailed the Serapis into Texel, the Dutch government entered the design of the flag into the flag registry (which hadn't been done yet for some reason) and had a flag made for the ship. This timeline makes a little more sense because it occurred only one year after the Flag Resolution, leaving little time for Franklin to have received the official US flag description. It also makes better sense with the timing of the letter to the Sicilian Ambassador because it is also dated before the battle. The question of why the Dutch hadn't entered the design of the Serapis Flag into the flag registry when they first received it from Franklin, however, instead of waiting until the Serapis incident, leaves doubt as to this story's accuracy. One final version of the story has Franklin giving the Serapis Flag to Jones while in France before he began the mission that took him to Flamborough Head. The flag then went down with the Bonhomme and Jones was able to create a new one when he got to Texel. 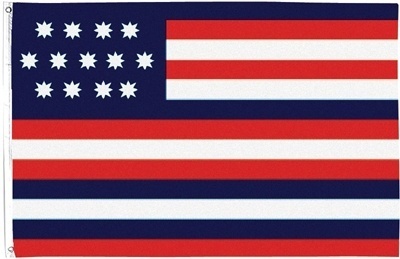 The Serapis Flag is a popular historic American Flag, probably due to its unique design and is still available from many flag dealers today. It was featured on a stamp in the US Postal Service's Stars and Stripes series in 2000. It is also featured on the crest of the USS John Paul Jones, a US Navy missile destroyer, along with the First Navy Jack Flag. Order your very own Serapis Flag here and help support this website with your purchase.